Hi, my name's Bob Ross and I sell local marketing services full-time in the trenches just like you. If any of that rings true for you too, then you desperately need my help. I'm going to show you how to instantly get prospects genuinely interested in what you've got instead of treating you like a pest. I found that most of the stuff I really wanted to sell (like consulting) was impossible to prospect for because it's just too hard to sell things that are complex, involved, or expensive to cold prospects. By putting together these self-working, super affordable, unique, and highly intriguing services, I've been able to rope new clients in at speeds and quantities you've probably never dreamed possible. Now, selling expensive services is leaps and bounds easier because now we have relationships where they actually listen and pay attention. And you can simply copy everything for yourself! Best of all, you won't have to slog through eight hours of mindless video or open a dozen tiny PDF's to learn any of it. I've tossed all filler aside and crammed every ounce of actionable material into a highly streamlined manual designed to work immediately. I'm confident that with just the simple knowledge and resources within, you'll transform into one of the most, if not THE most fascinating marketer in your town. No longer will you struggle to get business owners to comprehend what you've got. No longer will you look or sound like every other marketer. Say goodbye to the frustration and humiliation of what you're used to. With these sparkers, you'll have them impressed, excited, and demanding to get things started immediately. In essence, you'll be able to actually END YOUR DAYS WITH DEALS for once! Business owners LOVE to get their business in front of new residents but they have no clue how. You'll make it easy as pie. Restaurants and other businesses can see huge upticks in business from Birthday buyers. You'll be able to find and reach them like they've never thought possible. Use my Done-For-You sparking 'matches' to sell print services without knowing anything about the printing biz - or owning any equipment. For Only $50 - $100! Sparkers aren't about selling high ticket services. They're the gateway to get you there and make it much easier. Sparkers give you something powerful that they can take advantage of WITHOUT having to "connect the dots" or do much thinking. They just simply make sense instantly without needing any salesmanship. And you can still make a quite respectable profit in the process! What else can you sell for $50 - $100 that is wildly interesting, profitable, and actually works? Take this one for example, using the new mover sparker applied to a large co-op postcard. You simply source the new movers (easy as pie), create multiple ads on a large postcard and sell off the spaces for $50 or $75 or $100 or $200 or whatever the heck you want. Heck, I'm even including the fully editable photoshop TEMPLATE for you! Just pop their info in and be done with it. 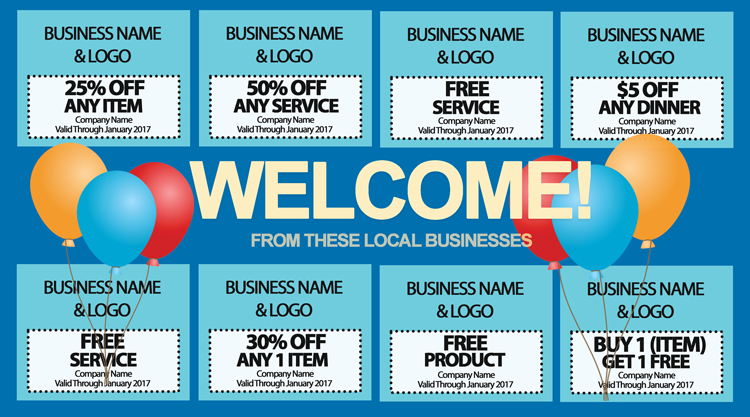 I don't know any faster way to get local business clients in your stable than by using these zero-resistance sparkers. They essentially sell themselves so you don't have to educate or explain anything. You just bring it to their attention. Things Like This in The Mail? They're well received, get redeemed, and provide a new, ultra-affordable marketing channel that business owners never have imagined would be possible. 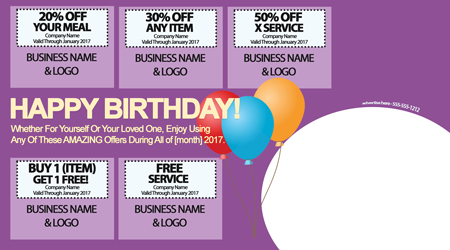 Use the same template with different wording for birthday marketing and sell the spaces off on that one too. Any idiot with photoshop can enter the basic information in using my DONE-FOR-YOU template that's included with this guide. Save yourself hundreds and hundreds of dollars in design fees and time. That's actually exactly what sparkers are for. You see, that's the beauty of them is that they're designed to simply rope clients into your stable quickly and deliver fast, real results so that you build relationships quickly. That's how you sell pricier services -- not by cold prospecting but by offering it to EXISTING clients who now trust you. REAL marketers just like you are using these sparkers right now and seeing tremendous results. Just look at the real reviews and comments below. It works, it's proven, it's simple, it's easy, it's reliable, and completely BS free. As you probably know, Dentists are one of the most lucrative clients you can have as a local marketer, but they're SO hard to prospect unless you get lucky or have a personal "in". I struggled with prospecting for Dentists for a long time until I found a little secret that's been flying under your radar the whole time. It's a sparker anyone can use on virtually any dentist, with a disturbingly high degree of success. It's the very best way "in" that I've ever discovered. This secret alone is worth the entire guide. Due to the digital nature of this information, templates, and scripts, there will be no refunds given, sorry. Everything is clearly presented and you may inquire about anything to me at itsbobross [at] gmail [dot] com if needed. Serious marketers only!